Thank you for selecting BAS as the administrator for your self-funded plan. 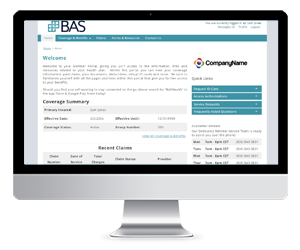 By logging into MYBASHealthPortfolio, you will have access to administration of your plan down to the member level, as well as a multitude of reporting capabilities. We have created a menu of standard reports, but you will also have the ability to create reports or request reports to meet your specific needs. In the self-insured world you may be familiar with the effort, energy and thought that goes into a plan design to make sure it fits all the needs of its members. We have taken the same approach in our portal design in putting together the tools you need manage your plan, broadcast your benefits and assist your members on a number of fronts, all from your office. The Employer Portal includes a secure message feature that allows you to contact our Customer Service department to ask questions that will be assigned a unique tracking ID. You will then be alerted via email when a response is waiting for you. The Employer Portal was built around our service request module. The service request module allows our Employer admins to submit a number of requests that are strategically routed to the experts within our organizations. These service requests include New Enrollment, Terminations, Coverage Changes, Dependent Adds, Ask A Question, Document Submission, ID Card Requests and more.. Does your plan have ancillary benefits, forms, links or videos you woudl like to showcase to your members through the health portal? We can work with you to customize the experience for your members. Adding a dedicated page, additional forms, or more is what this portal was designed for. Depending on your plan setup and permissions our portal makes it easy to find the claims or eligibility information you are looking for quickly. Boasting both Basic and Advanced Search options getting the information has never been easier. Healthplan reimbursement based on the fair market value of the services rendered. Reference Based Pricing (RBP), also commonly known as Cost Plus Pricing, offers self-insured plans a defined benefit structure based on more economical reimbursement levels designed to be fair and reasonable to providers based on various pricing data sets, most notably Medicare. Employers are driving a trend toward alternative medical cost management seeking reprieve from inflated medical pricing and PPO overpayment. It is apparent we are paying too much for our care, and RBR is a solution growing exponentially in use that provides patient’s choice, saves employers money, and provides quality care. RBR eliminates the need for a PPO. Interested in Learning More About Vendors? ProviderPlatform is our exclusive collection of tools and resources to help physicians, hospitals and health care professionals quickly and efficiently get the information they need to service our members.